Barney and Norma are just trying to get by and keep their jobs, but working at the Dead End theme park also means battling demonic forces, vengeful ghosts, time traveling wizards, and scariest of all--their love lives! 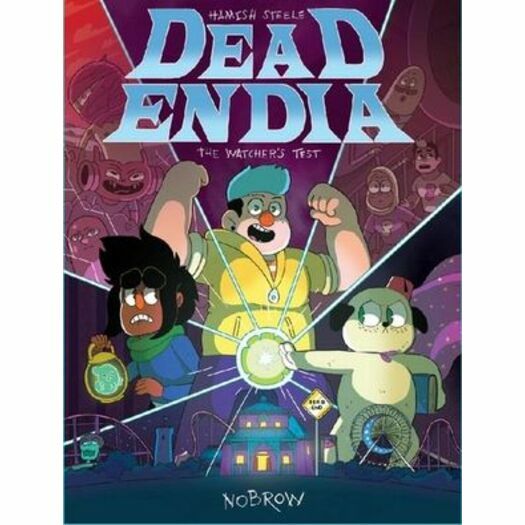 Follow the lives of the young adult employees of a haunted house theme park, which may or may not also serve as a portal to hell, in this hilarious and moving graphic novel from the bestselling author of Pantheon. The fun (and drama) never stops at Dead End! Hamish Steele is a freelance animation director and illustrator who grew up in Somerset surrounded by legends, myths and folktales. Since graduating from Kingston University with First Class Honours in 2013, Hamish has worked for the BBC, Cartoon Network, Blink!Ink, Disney, Nickelodeon and Random House, among others. Hamish currently lives in London.